Delemma » Wired for sound…….. and other things. Wired for sound…….. and other things. Electronic textiles are growing out of their geeky reputations. Smart textiles which previously have been viewed as just another fad have exploded out of the infancy phase. Move over age-old materials such as wool, cotton and silk and time proven techniques such as weaving and sewing and quilting. Intelligent textiles are the future and not just for the avant garde set or electronic geeks. By blending electronics with fabrics and materials you have the emergence of an industry capable of creating textiles with the capacity to make important decisions: not just changing the colour and the temperature of clothing. In the future many different sorts of devices will be incorporated into textiles and clothing. Apart from the fun and trend setting cool aspect of this shift there are serious applications for smart textiles. The military are a big part of the growing trend towards the use of intelligent textiles. The advantages for the use of these smart clothes in various essential service applications range from mundane dirt resistance and odour free uniforms to amazing safety ‘camouflage’ features. Intelligent fabric abilities to make swift colour changes to bring about effect camouflage whilst out in the field are examples of mainstream applications of these very smart textiles. The benefits from incorporating intelligent materials capable of reacting to impulses coming from outside or inside in the biomedical field are enormous. Integrating intelligent property within the material or structure of textiles offers the possibility of delivering major advances in health care. The implementation of technology such as LEDs and microprocessors within garments also provides new ways to bring about effects for less serious pursuits. Now artists wishing to make a splash on stage can show-case their talent by merging their art with the spectacular stage appearances afforded by the technological advances of the digital age. This gives the definition of performance art a whole new concept. Last year, top technology magazine Wired featured an article about the Pretty Smart Textiles exhibition held in London. The exhibition featured sixteen works and seven interactive samples of what must be regarded as way-out ‘fashion meets technology’ design work. But then again the exhibition did make the reporting pages of a top online tech magazine. To give one example of the work presented at the exhibition – The Circuit Dress. This garment is described by Wired as ‘not just clothing but also a musical instrument’ . 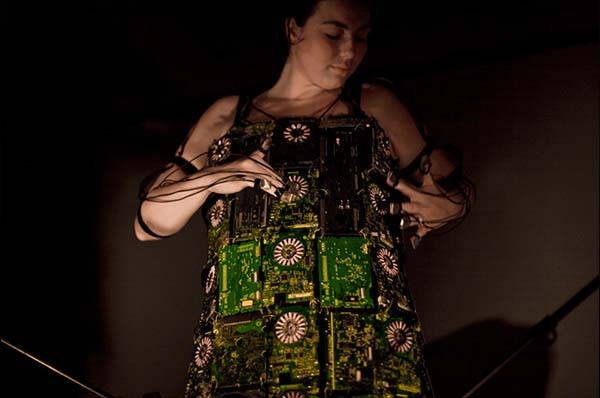 The dress is based on the concept of circuit bending, which involves deliberately short-circuiting electronic musical devices to get unexpected noise. What a blast – just kidding. Fashion meets smart textiles gives Joseph’s technicolour coat a whole new meaning. Or does it? PS- Perhaps this is too harsh. Fergie did look spectacular at the Super Bowl this year in her ‘football inspired’ leather LED outfil and her amazing hi tech boots.